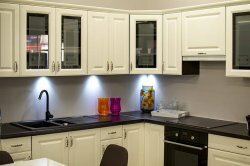 The aura kitchen and cabinetry in Toronto can help you customize your cabinets in a much better fashion than you think. No matter if you want the cabinets in the kitchen corners or above the cooking stove, the same would be catered to with utmost care. The aura kitchen cabinetries would present you with unique styled cabinetries that would match your surroundings.